Our mission is to accelerate medical and scientific research by providing powerful tools to organizers and attendees of live CME conferences. We enable you to engage and mobilize your members, leveraging their inherent domain knowledge to help you plan and deliver exceptional learning experiences. As organizing live CME conferences becomes more efficient, the opportunities for collaboration and discovery among members and attendees are expanded, pushing your whole field forward. Whether you hold one or ten conferences a year, ConferenceBrain enables you to create and manage each one independently. Attendees, faculty, abstracts, awards, scholarships, exhibitors, sponsors, events and sessions are all managed in one central location. View, sort, create, edit and organize accounts, and members. Collect membership dues by credit card or check. Automatically deactivate expired memberships. Offer discounts on conference registration for members. Automatically publish a searchable directory of members. Create and manage website pages using the built in content management system. 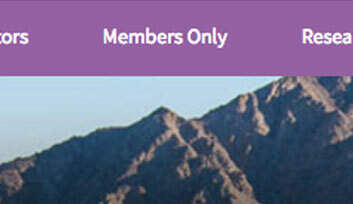 Provide "Members Only" content. Create and deliver HTML Email newsletters to all or part of your membership list. 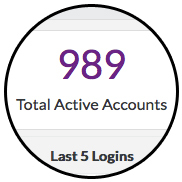 Receive detailed reports showing email opens, click-throughs, bounces and delivery errors. 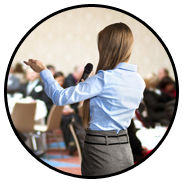 ConferenceBrain enhances relationships with our members, attendees, sponsors and exhibitors. I would highly recommend them, you will not be disappointed. Assign conference dates. 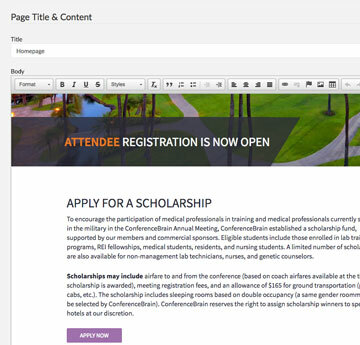 This features allows you to set the start and end date for a conference, as well as the start and end date for online attendee registrations, exhibitor registrations, scholarship applications and abstract submissions. Manage abstract submissions. 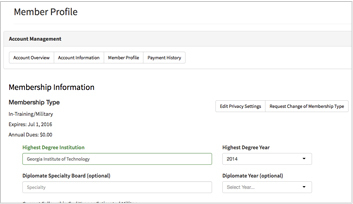 This feature allows administrators to view, edit, sort and export abstract submissions. Abstract judges can login to review and rate abstracts. Admins can then automatically notify submitters if their paper has been accepted or rejected. Complete exhibitor management. View, sort, create and edit exhibitors within an individual conference. Exhibitors can select booth space from an automatically updated exhibit hall map based on available inventory. Download and print customizable badges and tickets for each conference. Create social events, assign cost for each event. Attendance for each event is tracked so you better manage food and beverage and required space for each event. Create and manage conference sessions or talks. This feature also tracks conflicting sessions, so your members know if two sessions will be happening concurrently. Assign members to be abstract judges. This feature allows judges to download an abstract PDF through their individual accounts, and submit their rating and comments. Peer review of faculty presentations to ensure conformance to rules of your accrediting body. 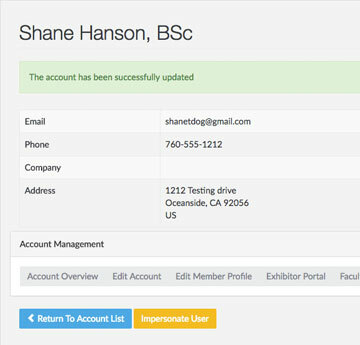 Complete exhibitor management. View, sort, create and edit exhibitors within an individual conference. Automatic generation and download of CME certificates for attendees to download from their individual accounts. 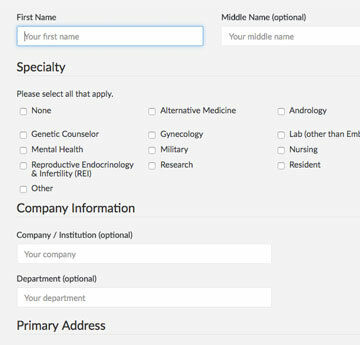 Customize the information collected when an account is created with specialties and credentials unique to your organization. Manage New Members: Optionally require review and approval before membership is accepted. 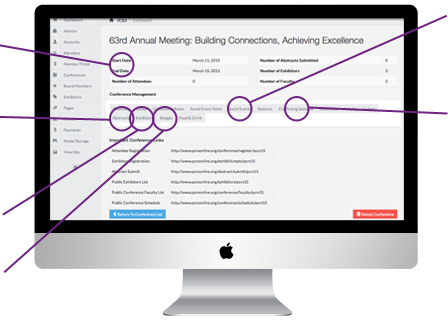 ConferenceBrain allows you to assign members to the board of directors or other groups and committees. Public profile pages and badges for committees encourages participation among members. Easy to use content management system allows you to add and edit pages to your website. Upload photos and videos to easily add galleries to your site. The ConferenceBrain mobile app is tied directly to our web based conference management system. Updates to the schedule of events in ConferenceBrain are automatically and transparently pushed out to all mobile app users. The push notification tools allows you to send notifications to all attendees. Attendees log in to the mobile app using their same website credentials. It couldn't be easier to add a mobile app to your next conference. ConferenceBrain is a service of TD Media.